A Splash of Yessy: Ruffles and Beading and Lace, OH MY!!!! Ruffles and Beading and Lace, OH MY!!!! The lobby at Weddings by Debbie. 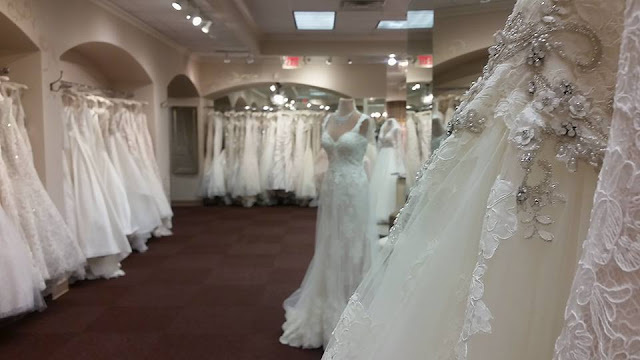 Shopping for my perfect dress was exciting, frustrating and every other emotion in between. They say that third time's the charm and that was definitely the case in my wedding gown hunt experience. The search began at Winnie Couture at the end of last year. Although I did not find the dress that day I realized what silhouette fit me the best, which was a good start. A few months later, this time joined by my mom and soon to be mother in law, I went to Brickhouse Bridal. It was here that I found a dress that I really, really liked. That particular Pronovias was not what I had envisioned but there's a reason why they recommend trying different gowns on, you just never know. Although I liked the dress, I felt there was something missing... something was keeping me from "loving it" so I realized that wasn't my dress. I left a little disappointed but I knew I was getting closer to finding the perfect gown. 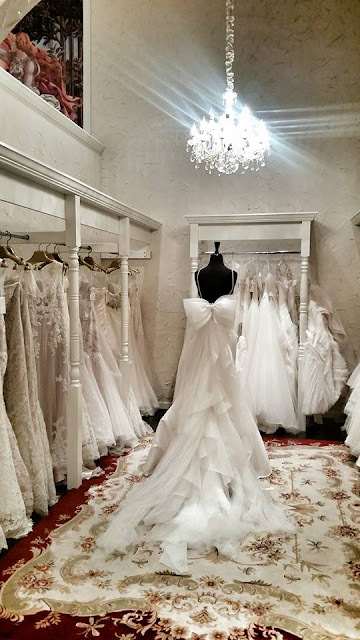 I fell in love with this fun "bow dress"
I scheduled my third Bridal consultation at Weddings by Debbie a few months later and I had a good feeling about this appointment. 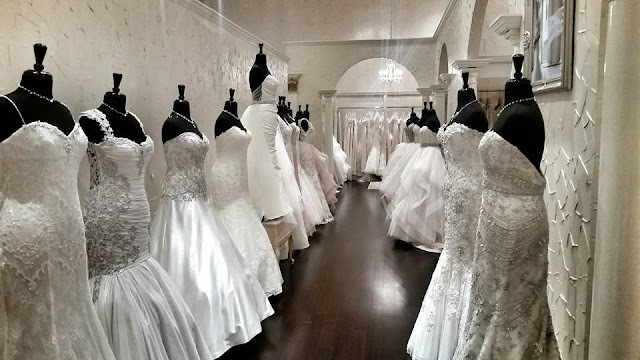 I even told my mom that I was sure I would find my dress at this place. We walked around and picked tons of dresses to try on while my consultant pulled a few for me as well. Every dress I tried on was beautiful, but I quickly learned that was not enough. Many of them were incredible but extremely uncomfortable and I found myself tugging at it and walking funny. I knew that it wasn't "the dress" if I wouldn't be comfortable in it. Endless possibilities at Weddings by Debbie. I had laid my eyes on a gown worn by one of the mannequins when we started browsing for dresses but I didn't think it was what I wanted. After trying about a half dozen dresses on I realized I couldn't stop thinking about that dress on the mannequin, there was just something about it that kept calling my name. The consultant brought it over and after seeing it on, I instantly knew it was everything I was looking for. The color, the style, the details... everything about it was perfect for me. As soon as I put a veil on it brought it all together and I knew, without a doubt, it was "the dress" and so did everyone else. There is no doubt that you just know when you find that perfect dress. I couldn't picture myself walking down the aisle towards my future husband in anything else. 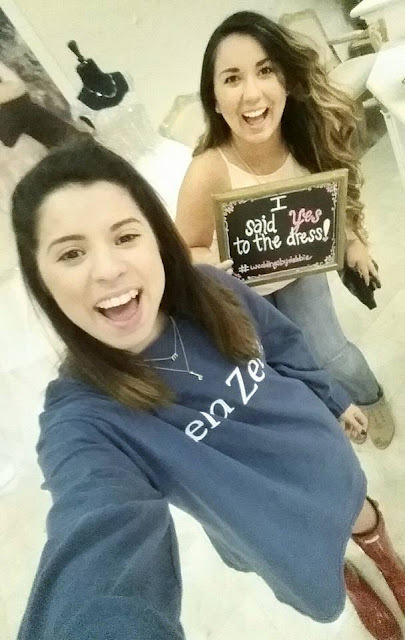 The search for my dress started off a bit slow but ended up being such a great experience, one I will never forget. 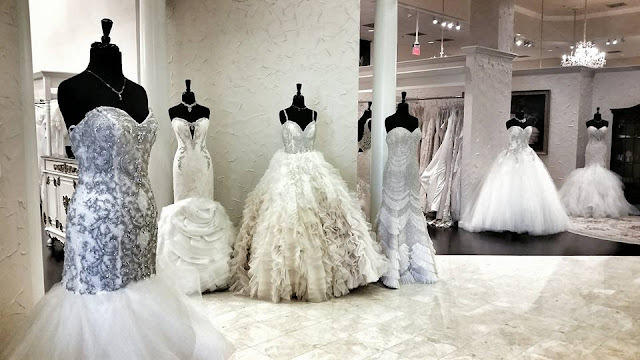 Just in case you're wondering, none of the dresses pictured above are my dress... I'm saving that surprise till the wedding day. My little sister and MOH. I can't reveal my dress yet but I will leave you with a few quick tips I've learned along the way. They might seem like no brainers but this is just a little reminder. 1. 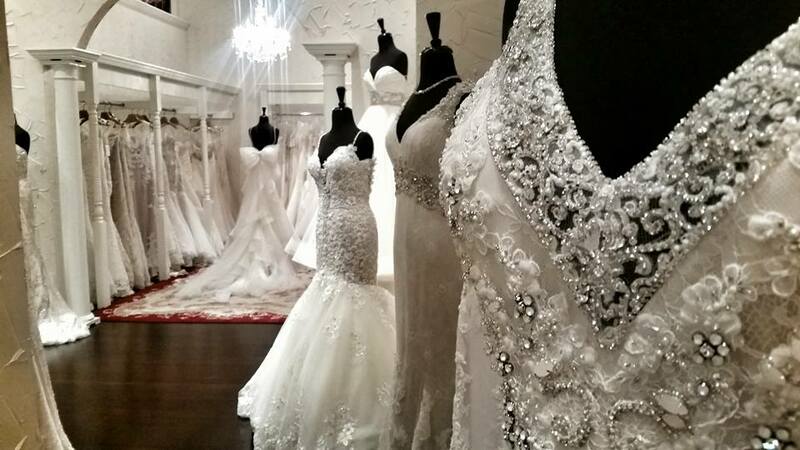 Try on all different styles even the gown you never envisioned yourself wearing. Who knows it might be the one, if nothing else you’ll at least get it out of your system. 2. Dresses always look better once they're on you than they do on the hanger. 3. It’s not enough to feel beautiful in your dress, make sure you’ll be comfortable enough to move around the day of the wedding. 4. Keep an opened mind the whole time. I'd love to hear about your wedding dress shopping experience.